Editing and making custom videos, movie clips, etc. with Filmora Wondershare Video Editor is a simple task since it offers powerful editing tools, unique video effects, filters & transitions, and other great features valuable for both beginners and professionals. Using this popular video editing software helps making professional looking videos very easy for inexperienced users. Whether the video is in standard or HD format, produced through smartphone camera, camcorder, laptop webcam, and digital camera, the program could import the video file and provide the required tools to edit it through Wondershare Filmora intuitive and simple interface. Lots of starters who want to get quick and nice results out of their videos shot on their vacation, work, home, or in other situations find this application very easy to use and helpful. Wondershare website also contains user-created clips which are a great way to learn about the power and abilities of the software. Video & audio editing – all basic video editing options could be found here such as trim, rotate, crop, merge, aspect ratio, hue, saturation, brightness, contrast, video speed, etc. The options also covers audio as well including split, trim, voiceover, fade in, fade out, volume, and speed. Advanced visual effects – one of the key aspects which make the software different from some competitor products is the vast number of effects which could be used for the videos. Different filters, elements, overlays, and titles and texts are available in the effects library which is constantly updating and growing in size. 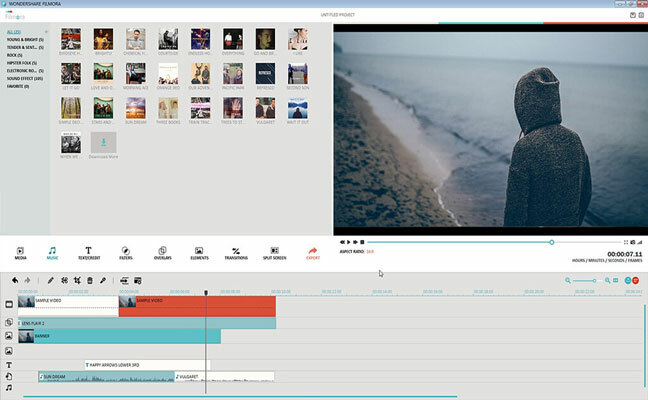 The resource package of Filmora software which contains more than 300 effects could also be downloaded from the official Wondershare website in order to take advantage of the Full Feature mode of the program. Easy publishing – the software makes it very simple and easy to share created videos to main social media and video sharing websites. DVD burning with Filmora Wondershare is also possible with no difficulty. The program could be used to optimize videos so that they would be most with Android and iOS tablets and smartphones. The above features were mentioned to give a quick idea about the program and the possibilities available once working with it. For more detailed overview it’s better to give it a try and see for yourself how this great video editing software works for you. There are lots of YouTube videos on Wondershare related to its overview, tutorials, effects, comparisons, and so on. Those could be a great resource for everyone interested. One of the great advantage of using Wondershare video editor is that in addition to the Microsoft Windows version like many other similar programs, they offer a Mac version (compatible with OS X 10.7 or higher) as well, which is very useful for users with Apple devices. Also, the Windows version of this software is compatible with almost most versions including Windows 10, 8, 7, XP, and Windows Vista. Please note that the free version is in fact provided as a trial version which of course offers the same features as the paid version. For more advanced users – and those want to remove the watermark in the output clips –, we recommend buying the software (and activating it), which could be through one-year or life-time licenses which cost around $30 per year and $50 respectively. Depending on situation and needs, either plans would definitely worth the money paid. They also give a money back guarantees for 30 days to make sure their customers are fully satisfied with the product.